In the living room, an 18th century jajim, purchased in Istanbul, hangs behind a Molteni & C sofa covered in woven linen with mohair pillows. The wool rug is from California Carpets. In the kitchen, designer Maca Huneeus prepares lunch with her daughters Ema, 12, and Ofelia, 7. The pendants are Jonathan Adler; the island is a custom design, inspired by a 1960s Dansk tray that belonged to Huneeus’s mother. The barstools are from Blu Dot. An oversize oval black linen shade from Dogfork Lamp Arts hangs above a table Maca created out of a wood slab from West Marin-based artisan Evan Shively of Arborica. The bench seats are De La Espada; the brass candelabrum is vintage, sourced from 1stDibs. The credenzas are Bo Concept. In the kids’ bunk room, Maca designed walnut beds with built-in storage and fabric headboards, and covered each one in hand-knit blankets by Marcela Rodriguez-Chile. The giraffe sconces are from Jonathan Adler. The girls play on a hand-embroidered Olli lounger from Heath Ceramics. The team reviewed twenty years of snowfall data to find an average that would dictate the height of the house’s base. They also extended the roof to protect both the front entrance and the deck—this way the family doesn’t need to worry about snow removal upon arrival or dealing with windows that won’t open. Maca inserted a closet-dressing room between the master bedroom and bathroom to offer more privacy to each space. She chose a vintage George Nelson lamp to lend character. Talo Mini chrome sconces from Artemide installed atop the mirror in the master bathroom effectively disappear, becoming what Maca calls “subtle 3-D sculptures.” The Neo Blanco vanity, from Porcelanosa, is clad in the same Douglas fir as the ceiling. The IQ faucets are from Jado. During ski season weekend, for about ten years, Maca Huneeus, her husband, Agustin Huneeus, and their young daughters Antonia, Augustina, Ema and Ofelia, would decamp from their home in San Francisco to drive three hours to the Sugar Bowl ski resort in Norden, California. Maca and Agustin, who are both half Chilean, met while skiing in the Andes, and they wanted their children to grow up with the same kind of exposure to the outdoors. The Sugar Bowl community is very close-knit—homes usually only change hands through word of mouth, with many families staying for generations. Each year the Huneeus family would rent, always looking for an opportunity to purchase a home of their own. Finally they found their chance in a property jointly owned by two neighbors, held undeveloped for many years. 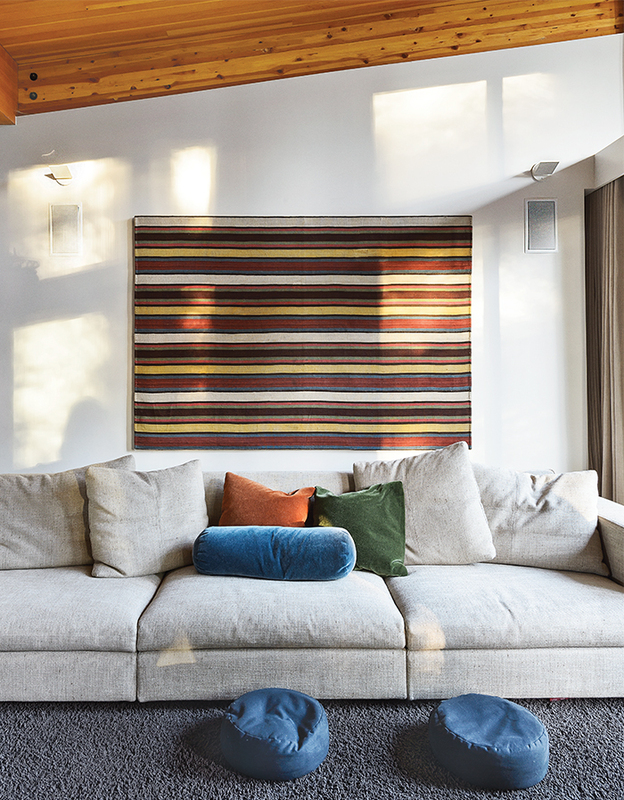 After brokering the deal from a chairlift, Maca, an interior designer, worked with architects John Maniscalco and Rob Kelly to build a decidedly modern retreat nestled among a series of Alpine-style chalets built in the 1940 and ‘50s. Here she shares her story. Maca Huneeus: I always had a vision of what I wanted—a simple, uncomplicated home where there was nothing to add and nothing to take away. I promised my neighbors that I wouldn’t build anything over 3,500 square feet. A few other people wanted this lot, but I was told that they had a larger footprint in mind and wanted to place a house toward the road. I wanted something discreet, and John was able to set it back. Dwell: This is an infamously difficult area to reach in winter. How did that challenge your design process? MH: The snow here presents one of the heaviest loads in the country, so we had to consult with a few engineers. A foundation must be in before the snow comes in mid-November, so we were on a tight schedule. We closed on the property in April, John had the plans in May, and by July, our contractor had broken ground. I had a vision, then John interpreted our needs architecturally and spatially and worked to execute them with architect Rob Kelly. We divided and conquered. The house met all the deadlines to move in before the 2009-2010 ski season. Dwell: You waited ten years before you were able to buy here. Why was this area so appealing? MH: Sugar Bowl is the closest ski resort to San Francisco. It’s quaint and beautiful—you go up the mountain in a gondola, so it’s only ski-in and-out. There are no cars here—we drop ours off on Friday, and we do not get back into it until Sunday. At the time we started coming here, our kids were young and I wanted an environment where they could walk from house to house and I didn’t need to worry. It’s an old school-type place. The families who come here are about skiing; they’re in love with the outdoors and very physically active. Dwell: What was the plan for furnishings? MH: I wanted pieces that would be timeless: classic, modern, and warm—things that would never leave this house. The house organically started to feel South American, as I worked a lot with textures and natural fabrics: wool, linen, cotton, cashmere, and raw silk. Our home feels very cozy and inviting, with a big emphasis on craftsmanship. Dwell: How often do you use the house? MH: We try to go up every weekend. I look forward to winter because we have this place. The girls have been part of the Sugar Bowl ski team for years, and we also use the house for a couple of weeks in the summer when they go to camp—they can go river rafting, mountain biking, and rock climbing. In July and August, the mountain is covered in wildflowers. It is the kind of place where, if you love nature, you come once and you are hooked.